DENVER — There is a slowdown at the State Capitol, one that both sides of the aisle will admit to. “The constitution gives us the right to say ‘Slow down. Don’t make these big changes,’” Senator Own Hill from Colorado Springs said. On Thursday, Hill requested that the Senate journal, or minutes from the previous day’s session, be read back in full before work could start. That took a half hour to complete. Hill then asked for multiple bills to be read out loud in full before they were voted on. “We’re affecting millions of jobs and billions of dollars and we should slow down that discussion rather than just rush stuff through,” he said, referring to the Democratic majority in both the House and Senate. The Democratic Majority Leader of the Senate disagreed with the tactic, calling it "obstructionist." “They’re basically slowing things down to a crawl and creating an embarrassment for the institution of the democratic process,” Senator Steve Fenberg said. Both sides agreed that the tactics were within the rights of all Senators to ask for. The reasoning behind putting those tactics into action was where the disagreement was found. “A tyranny of a majority says we don’t need to listen to outside input, then I’ll say if you’re going to do that it’s going to take a while,” Senator Hill said. Last week, Republicans asked for a 2,000-page bill be read in full. Democrats attempted to use a computer to speed up the process, but a court ruling said that wasn’t allowed. It’s estimated that bill could take 16 hours to read out loud. While that could cause a delay for many controversial bills on Capitol Hill, the Democratic majority and Democratic Governor may still get their way anyway. One major impact that could have is when it comes to the state budget, which must be passed by early May. 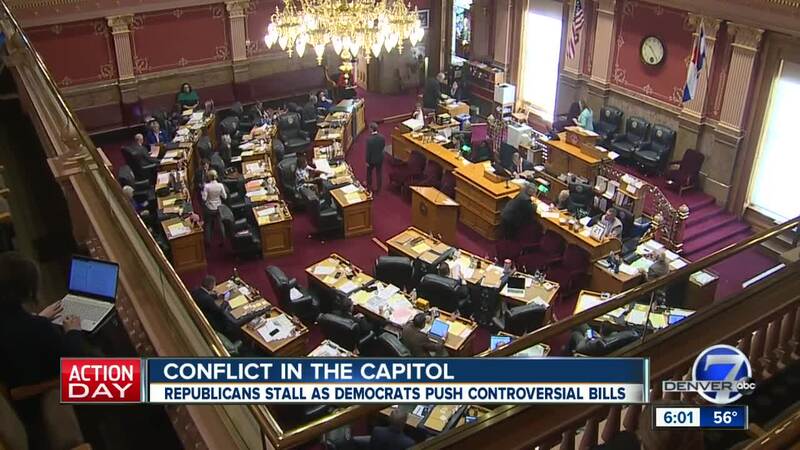 “That’s when you start talking about this obstructionist tactic (and how it) will impact every person in the state of Colorado,” Senator Fenberg said. “We have six weeks left. The budget is supposed to be next week. We’ll see,” Senator Hill countered. It took the Senate two-and-a-half hours to vote on two total bills on Thursday morning. They went back into session Thursday afternoon.